← Mezcal? You Mean the Stuff with the Worm? If you’re a Caribbean rum company, one with a fair amount of credibility in the cocktail community but not a lot of name-recognition in the U.S., what’s the last thing you should do to increase your profile? Sue a popular tiki bar. The rum company is British Virgin Islands-based Pusser’s and the tiki bar is Painkiller on the Lower East Side. The story starts last summer. That lawyer apparently had a case. 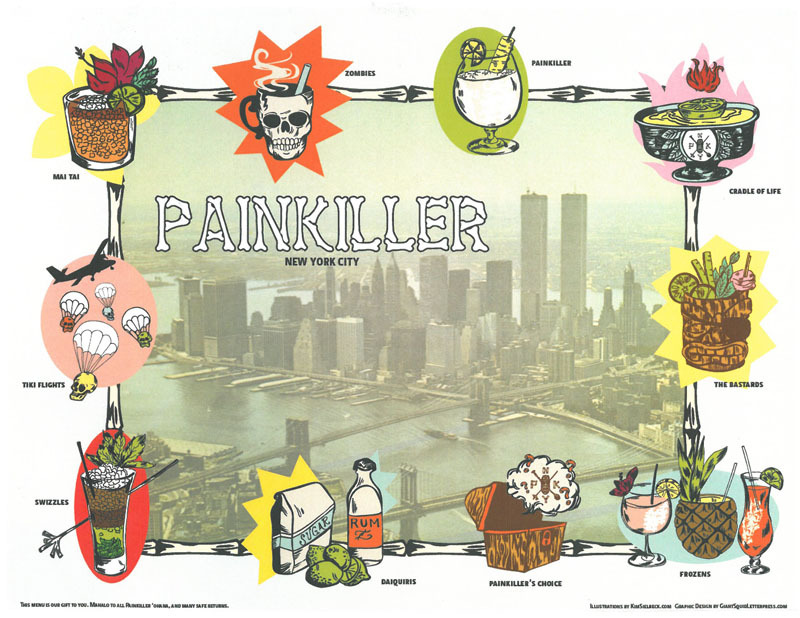 According to a Lower East Side blog called The Lo Down, Painkiller was forced to change its name to PKNY, as Pusser’s has the trademark on the Painkiller cocktail (which they say can only be made with Pusser’s rum and “four parts pineapple juice, one part cream of coconut and one part orange juice served over the rocks with a generous amount of fresh nutmeg on top.”). “In a consent order signed by both parties May 16, Gonzalez and Boccato, along with their corporate entity, Essex Street Bar & Lounge, Inc., agreed to be ‘permanently restrained and enjoined’ from using the trademarked term Painkiller or ‘any other confusingly similar term’ in association with any bar, restaurant, grill, lounge or other establishment, or any ‘beverage, libation or cocktail’ unless it is made with Pusser’s rum. They also agreed not to use the term in any marketing or advertising materials, and to give up their website domain within 45 days of the order, though the court did not require them to turn it over to Pusser’s. With all that, you’d expect the term Painkiller to appear prominently on the Pusser’s website, but it doesn’t. Furthermore, many Painkiller recipes online don’t mention Pusser’s or the legal necessity that a specific brand of rum be used in order to call it a Painkiller. How is it that Pusser’s got the trademark? Pusser’s rum, which traces its history back hundreds of years, was re-launched in 1979 when Charles Tobias bought the rights to the original formula and name. Both Pusser’s and the bar formerly known as Painkiller acknowledge the Painkiller cocktail’s origins in the British Virgin Islands, at a bar called the Soggy Dollar. The Pusser’s website says the Soggy Dollar Bar’s Daphne Henderson created the drink, but Tobias, the owner of Pusser’s perfected it. The story, as told by Pusser’s, has a smarmy tone to it. Tobias wanted the recipe from Henderson, but she wouldn’t give it up. So he tried his own version, which he likes better than hers. They let the bar’s 10 customers taste both, and his wins unanimously. “She humorously insisted that somehow Tobias paid everybody off to win,” the story reads. “Of course, he hadn’t, and vehemently denied her charges.” Hahaha, that Tobias. He eventually trademarks it, “But he always gives Daphne Henderson credit with a by-line in Pusser’s printed media: AS INSPIRED BY DAPHNE AT THE SOGGY DOLLAR BAR AT WHITE BAY ON JOST VAN DYKE.” What a stand-up guy. If it were me running the rum company, and I wanted to enforce the trademark, I’d be gentle about it. Don’t sue the tiki bar, but try to work with them on promoting your rum. Focus your lawyers, if you must, on any other rum company that tries to use the Painkiller name, not the bars that serve it. It’s like Metallica suing its fans for illegally downloading their music. Sure, it makes sense on legal terms, but it totally alienates your core constituency. Now, a laid-back island rum company is acting more like a predatory international conglomerate (dare I say, like Bacardi). The only other trademarked cocktail I can think of is the Dark and Stormy, which must be made with Gosling’s rum. Hey, what is it with rum companies? Unfortunately, the name change is the least of PKNY’s problems now. It just earned itself a “C” grade from the City of New York for nine health code violations, adding up to 101 points, way up from its June 2010 score of 17. It’s too bad, because it’s a great bar. * Jacob Grier’s Liquidity Preference: Rum and trademarks. Grier points out that Pusser’s didn’t invent the Painkiller, and that Trader Tiki syrups recently had to change its name to B.G. Reynolds. It’s unclear which “Trader” sued—Trader Vic, Trader Joe, etc. * Robert Simonson’s Off The Presses: Pusser’s Rum Brings the Pain to Painkiller. Simonson traces the history of the Painkiller cocktail further back, citing tiki expert Jeff Berry, who says it was indeed invented at the Soggy Dollar, but by George and Mari Myrick, a good decade or so before Pusser’s Tobias trademarked it from the recipe he imitated by Daphne Henderson. 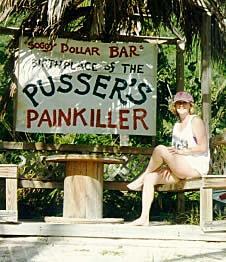 * The Lo Down: Painkiller’s Supporters Launch Boycott of Pusser’s Rum. The blog that first reported the name change says that there are now two separate groups rallying behind the bar and calling for a boycott of Pusser’s. * Timothy B. Lee’s Bottom Up: Dark ‘n’ Sue Me. Lee, in a post from two years ago about Gosling’s rum suing people for making Dark and Stormies sans Gosling’s, points out that the terms trademark, patent, and copyright mean different things, and that many of us are getting our legal stuff wrong. This entry was posted in Bars, Cocktails, Straight Spirits and tagged charles tobias, daphne henderson, painkiller, painkiller cocktail, pusser's rum, rum, soggy dollar bar. Bookmark the permalink. I’ve just come across this whole debacle and wrote on a few other sites… might as well give my perspective here too. I don’t know. Its not like the Pussers company doesn’t allow any bars to make the drink “Painkiller”, its that the bar in NY was using the “Painkiller” name in its Tiki Bar’s name. CLEARLY riding the coattails of all the investment and expense that the Pusser’s company put in over all the years and introducing it to the North American Market (Over $1 million – http://www.pussers.com/joby.htm). Look I’m a longtime Sailor and I’ve been to the BVI’s and also sailed and been to Annapolis MD in which they have another Pussers (which is one of the few in North America). I also live & sailed the NY, NJ waters and LI Sound for over 20 years and when I think PAINKILLER I think PUSSER’s. Plain and Simple. They’ve put the time, money and effort to promote PUSSER’s which for any self respecting sailor is synonymous with PAINKILLERS. Not that any bar can’t make one – But Pusser’s made it famous (with the ok of original inventors of the ~tiny~ Soggy Dollar bar in the BVI’s which is called the “Soggy Dollar” because you have to anchor out and swim to the bar to get a drink :)). With that said I feel the exact same way with a “Dark n Stormy”. You can make it with a different dark Rum other than a Goslings (like for instance a Myers’ and Ginger beer ~blech~) but when any self respecting Sailor thinks “Dark n Stormy” they think Goslings. Just a little bit of perspective from a “Sailor” where I guess traditions are still cherished — and I think most “good” bartenders and bars feel the same way. Tradition in making a classic cocktail is paramount. If not then you are just another one of those low class college bars like down Jersey Shore that serve any alchohol (usually the cheapest) and call it a “xxxx” (insert classic cocktail name here).